Please consider running this race on May 1. If not as a race, than as a workout. Rob Magin was a role model for me. He ran for my alma mater, UMBC, and graduated about 10 years before I did. When I moved to the DC area some 10 years ago, Rob was one of the first runners I met and I spent a great deal of time chasing him around Bethesda-Chevy Chase in my years prior to joining up with GRC. I also used his times, at places like Cherry Blossom and Pikes Peek, as benchmarks since we both left college with similar attributes. Unfortunately Rob passed away last May due to a Anaplastic Astrocytoma (essentially a brain tumor) leaving a wife and three children under the age of 10. I will be running. It'll be my first race back and the first race I've run since turning 30...coincidentally, it will be on my 31st birthday. Friends, please join me. Join our team and run the Race for Hope! As you can see, our team Rob Magin's Runners has already raised a lot of money, and you can help by donating, too, and joining the team. We would love to have more team members--fast or slow runners, or walkers--it doesn't matter. 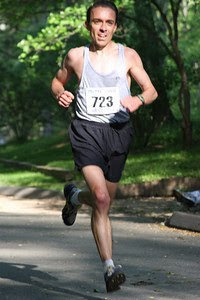 No matter if you run, walk, or jog, just get out there and have fun knowing that you are donating to a cancer society. When you join the team you can set your own goal of how much money you want to raise. Even if you only raise $40, you can still feel like you are helping someone. If you know someone with cancer, when you run the Race for Hope, you can feel that you are helping them by donating. By raising all this money, we can all help find a cure for brain tumors and cancer. We formed this team because my Dad had a brain tumor, and we know what it is like to have a family member with a brain tumor or cancer. So we want to help by raising more and more money, and you can help us too by joining Rob Magin's Runners! I hope you join us soon.